You can listen to 'The stars (are out tonight)' here. For all I knew David Bowie was retired ever since that fatal concert in Hamburg. On 8 January last he surprised us on his 66th birthday with a new single (read our review here) and the announcement of a new album for March. Since 8 January Bowie was never really out of the news. The marketing strategy really worked. The release of the album again whipped up a storm. And here it is on WoNo Magazine's blog post: The next day. David Bowie was the first "real" concert I went to in May 1976 in Ahoy, Rotterdam. The first of a total of five gigs between 1976 and 2003. The last album that I truly liked, for over 50%, though was from 1983 'Let's dance'. 2002's 'Heathen' and 2003's 'Reality' were sort of alright though. A great cover from Jonathan Richman's Pablo Picasso e.g. was great. So Bowie and I go back over 40 years, starting with 'Space oddity'. Let's talk The next day here. My first impression is that The next day on the whole is good. There is a sense of urgency and thank God no attempt to be modern in any way. (Well, a little in 'If you can see me'). We hear songs with a head and a tail. Bowie is doing what he's good at and is held in check by his producer of old Tony Visconti. The basis of most songs is the guitar, Bowie's rocking out and around that fact the songs are built. In reviews I saw so far people point out that the songs are a good cross-section of Bowie's career. All periods come by. To me this is fairly irrelevant. If the songs are no good, who cares whether Bowie references his whole career? I don't and if the songs are good, then who cares either? Too many of his albums in the past 30 years had too many fillers on them. All work, no inspiration. Not so The next day. So far the only complaint I have is the hideous cover. Why this ugly rehash of 'Heroes'? The album is not a new 'Heroes', but filled with songs. The album starts of with several up tempo songs with tight acoustic guitars and loud electric ones. First single 'Where are we now?' falls so incredibly into its place. The quality that was hinted at as a lone single, is revealed in all its beauty on The next day. In 1984 Bowie would have scored a number 1 hit with this song, as with 'This is not America'. Another total gem is 'I'd rather be high'. Bowie meets Oasis and wins with flying colours. His voice here is an aged one, but the melody, the guitar work all suggest a trip of high quality. And when he's high, he can be 17 apparently. '(You will set) the world on fire' sounds as urgent as the title predicts, with a hard riffing guitar. 'You feel so lonely you could die' is very close to 'Five years'. (The drum rhythm at the end, is a too big and obvious give away though.) A beautiful ballad that shows the versatility of this album. 'The stars (are out tonight)', the album's second single, is a slick mid-tempo song, with a prominent synth carpet and an incidental guitar eruption. While 'Dirty boys' is a modern version of Screamin' Jay Hawkins's Í put a spell on you'. Same rhythm stops and starts, but more modern and flowing more freely due to the singing. As I've pointed out before on this blog, for an artist who is recording close to 50 years, it is extremely hard to compete with his back catalogue. 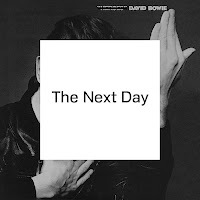 With the first few listens, it is impossible to really reference The next day to 'Hunky dory', let alone 'Ziggy Stardust' or 'Station to station'. Still, The next day is an album that I definitely want to hear again. And that is more than albums like 'Earthling', 'Never let me down' or 'Black tie white noise' ever did for me. So what is left then to conclude that David Bowie is back in true form. Even if Bowie only rehashed the best songs from different periods of his career, as some claim, he did come up with songs in 2013 that come up trumps and would look good in any time of his career. As far as I'm concerned, taking The next day in I can only say that I have a new favourite Bowie album, while I had no expectations. A good sign. What is amazing in this day and age, that the production process of this album was about two years and nothing was leaked. The team around the album was fairly large reading the personnel list of The next day, Visconti and Bowie must have put the fear of God in people. Just as well, not much trumps a good surprise.